This post contains some affiliate links. This means that if you click through and decide to make a purchase, the price you pay will stay the same but I might receive a small commission that helps me keep the blog running. Thanks for your support. I know. The title's completely in capitals, because this is totally amazing. I love it. It's a beef burger, but the bun is made out of two mushrooms, and then I've filled it with a juicy beef patty, zesty guacamole, bacon and a softened chunk of red onion. As you may have seen if we're friends on Instagram, I've been playing about a bit with AIP and Paleo burgers, lately. 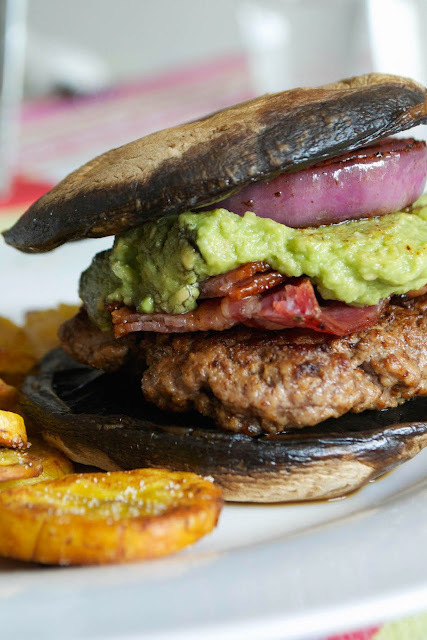 You can pick this up and eat it with your hands, and there's nothing wrong with that, but if you do, you'll want to have a load of napkins handy because although the lovely juices give flavour to the beefburger, roasted mushrooms do give off a heck of a lot of liquid. You've been warned. 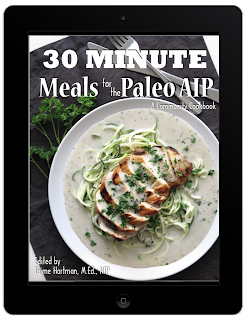 Want to unleash your caveman tendencies? Go ahead. Cooking this for a date? Best keep a knife and fork handy. First, preheat your oven to 200ºC/400ºF/gas mark 6. Get out a roasting tray or dish that's large enough to hold the mushrooms in - they will shrink once cooked. Tip the teaspoon of avocado oil into the palm of your hand and rub the oil over the mushrooms, over both sides. Sprinkle over just a pinch of salt. Arrange the mushrooms in the tray with the brown (underside) facing up and slide into the oven. Roast for about 20 minutes, until the mushrooms are softened and sizzling. Take them out and leave to cool. While the mushrooms are roasting, lay the rashers of bacon in a dry griddle or frying pan and cook, turning them over, until they are golden and slightly crisp. Lift them out with tongs and put on a plate, leaving to one side. Shape the beef mince into 4 large burger patties and then season with salt on both sides. Fry them in the pan you cooked the bacon in, about 5 minutes per side, turning a few times, until they're cooked through and the juices run clear. Peel and thickly slice the onion horizontally - add this to the pan and cook on a medium heat, turning, until the onion is soft and slightly caramelised. The onion is pretty amazing because it'll take on the bacon and beef flavours from the pan. Once everything's cooked, it's time to put the whole thing together. Quickly mash together the ingredients for the guacamole with a fork. On a plate, place one of the cooled, roasted flat mushrooms underside up. (You might want to tip out some of the moisture before you do this if it's especially juicy). 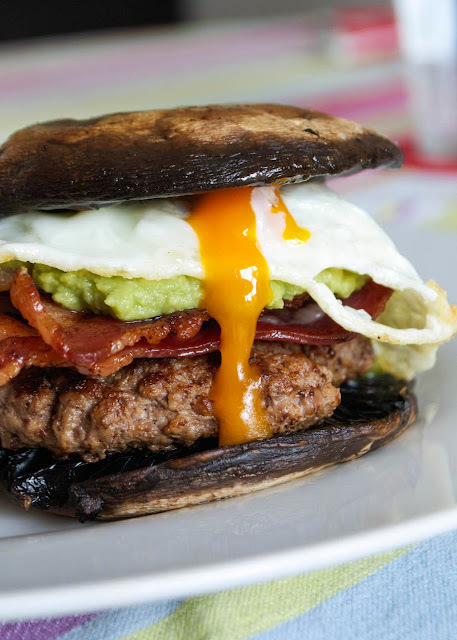 Carefully place the cooked burger on top, followed by the bacon rashers and the guacamole. Top with the onion slice and then another mushroom, underside-down on top. Done! 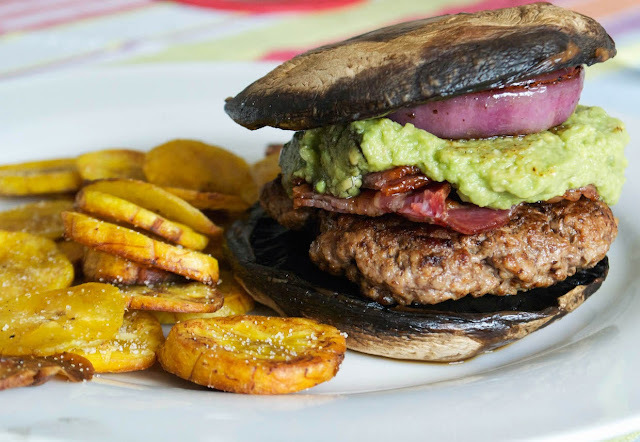 Serve with salad, or sweet potato fries or plantain chips. This burger is entered into Phoenix Helix's 75th Recipe Roundtable.